We have made it to St. Louis (just a few days shy of the tornadoes) and have begun settling in and finding our way around. Keith and Dad drove the moving truck and moved the boxes into the apartment. They rock. Charlie and I followed a few days later via airplane through Chicago. 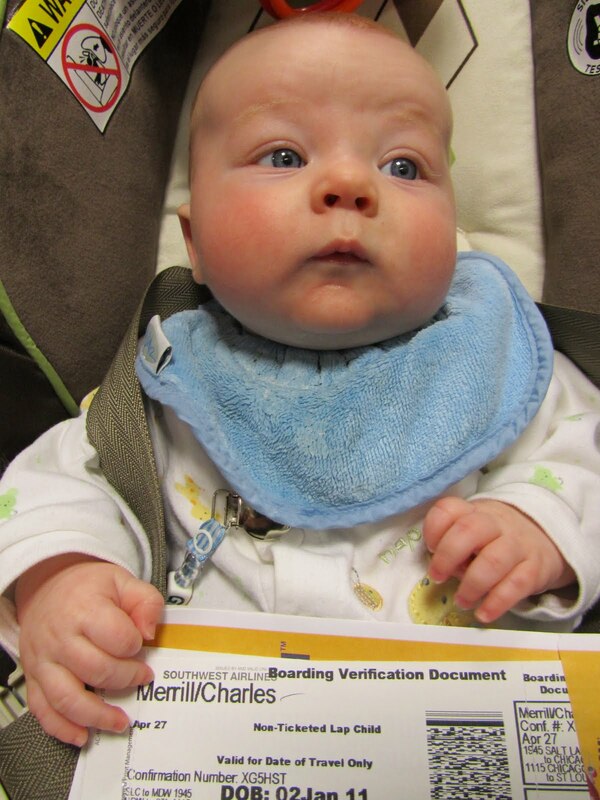 Charlie did great on his first flights. I got many compliments on how great he was from flight attendants and fellow passengers. That made me happy but I was glad to have it over with. Keith got the TV working just in time for me to watch the royal wedding on our second full day in St. Louis. I admit all unpacking came to a halt (for me at least). Keith has started his internship and is liking it. We went to the hospital and found the lab (Charlie will be getting his blood tests done there instead of at home because it is so close, but the are only once a week now!!!) and met Charlie's new dietician. Things are mostly unpacked and with flowers on the table it is feeling homey. Oh, and I saw my first Northern Cardinal! awhahaha love that you stopped to watch the Royal wedding. I didn't think I would get caught up in it but I couldn't help myself, it was awesome! And I LOVE Charlie's plane ticket with his name on it on his lap, sooooo cute. Glad you made it and that Charlie did so well flying! The pic of you watching tv makes your apartment look just like 117! Have fun in MO!